Thogayal is a Tamil word for Chutney. 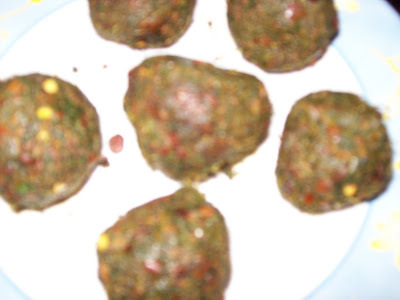 Thogayal is common in most South Indian households specially when you need something tasty and need it fast. I used to prepare thogayal of different kinds… thogayal with dals, coconut, vegetables like pumpkin, peerkangai ( ridgegourd ), brinjal, karuveplai(curry leaves), coriander etc,. Kothamali (coriander)Thogayal is of one kind. Thogayal last longer unlike other curries. 1. 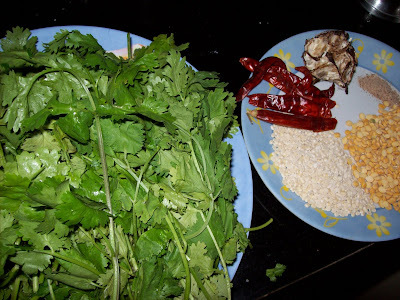 Wash the coriander(kotthamalli) leaves(take only the leaves & discard the stalks)- wash well & drain. Keep aside. 3. Add salt, tamarind & corriander leaves & toss nicely. 4. Now put the mixture into a blender & grind to a smooth paste. Do not add water. Make into small balls& store it. Whenever needed add water and use it. 5. Serve this chutney/thokayal for dosa, idli and curd rice. 6. Unlike uncooked chutneys, this can be refrigerated and used for a few days. tried this recipe. its awsome!! Thank you for the recipe.It was just the way my mom makes it.I was missing her food a lot and guess what ? not any more after trying this recipe - with pongal , it worked really good.